We extensively searched Europe's gourmet markets to curate an essential selection of ingredients for an authentic Liege waffle baking experience at home. Lesaffre, Valrhona and Francine are baking professional's brands of choice and now home chefs can add them to their arsenal of ingredients. Whatever your recipe, our specialty flours, waffle mix, yeasts and cocoa powders offer superior quality for wonderful results. Get Waffle Pantry's set of Liege waffle essentials and start baking your favorite Belgian waffle..
Bake exclusively with organic French T55 flour and match the highest European baking standards. 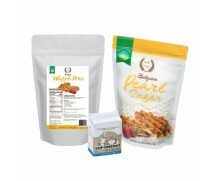 Impo..
French T45 flour is a soft and fine wheat flour, often referred to in French as farine de gruau..